Wasps' Sophia Candappa looks up for options. Picture by Clive Jones. 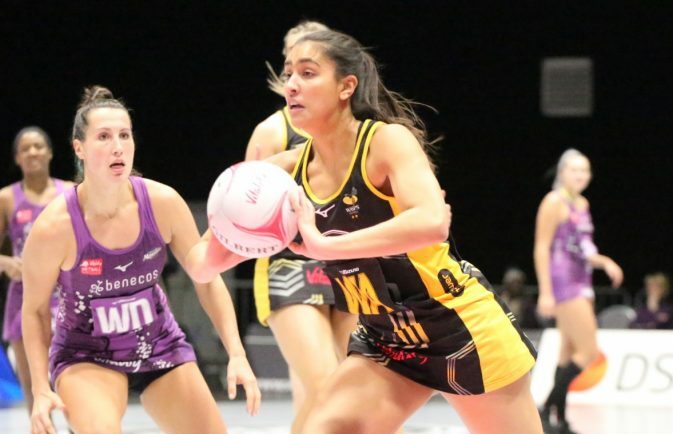 WASPS Netball remain top of the Vitality Superleague on goal average after a comeback victory in their toughest test of the season so far – beating Saracens Mavericks 54-40 at Ricoh Arena. Trailing in the second-quarter, the Black and Golds overturned the scores before resisting late pressure from the visitors to see out a fourth win from four. Head coach Mel Mansfield was delighted by the application shown by her side in training which has benefited them in their perfect start to campaign. “We knew this was going to be our toughest test yet and it was exactly that. We’ve had strong third-quarters in each of our last three games and that shined through again,” she said. Wasps’ George Fisher got the scoring underway but they were pegged back immediately by Katie Harris, before Sasha Corbin continued to make inroads into a comeback from the visitors. It was an end-to-end first quarter that ended with the hosts narrowly in the lead, but the second would see Mavericks conjure up some sharp shooting. Taking a five-goal advantage, Wasps managed to swing momentum after a stop from goal keeper Sam May, drawing level at the interval. Sophia Candappa emerged on the court and immediately shone, netting three unanswered goals that helped her side go further ahead. An eight-goal lead was reached, with Harris and Rachel Dunn playing some scintillating netball going into the final quarter, where Fran Williams made a real impact from the bench. Saracens would reply to come within four goals of Wasps’ lead, but Dunn made sure her team were out of sight with some immaculate finishing. Wasps are back in action next Monday night against Celtic Dragons (7pm) at Sport Wales National Centre, with their next home fixture coming against Strathclyde Sirens on Saturday 2nd March (7pm).